I’ve been a bit of a miss lately due to a bit of family stuff and work stuff, but I am back today brining you a review of the Black Label Trading Co’s Bishop’s Blend paired with a bottle of Deschutes 2015 Rye Whiskey Barrel Aged Abyss. Black Label Trading Co’s Bishop’s Blend starts out with a gorgeous deep, dark brown wrapper which is almost as close to black as you can get, while still being brown. The color is very consistent from cap to foot. The wrapper is laid seamlessly over itself carrying very mild veins, soft webbing, light tooth, and a whole mess of oils. 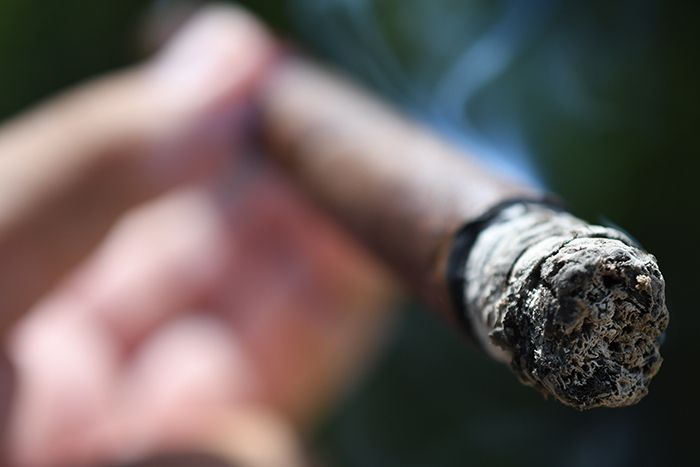 The cigar feels very firm, and very hard while the wrapper of the cigar feels very dense and manageable as it leads up to the round, tapered, sharp cap. 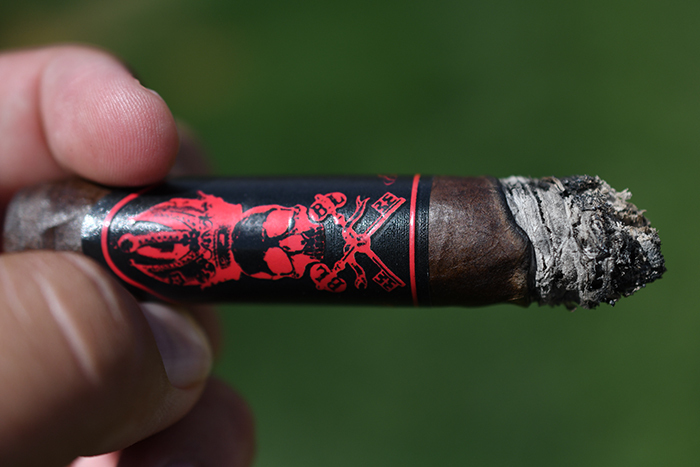 The cigar is then polished off with an awesome Black and Red Black Label crest on the band, along with a matching foot band that simply states “Bishops Blend”. 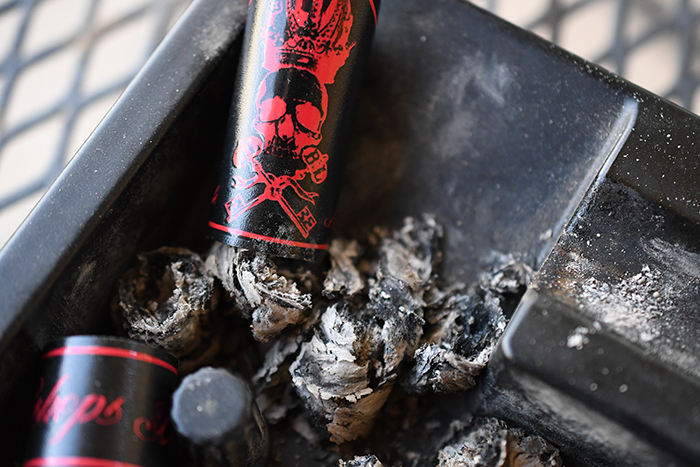 The wrapper on Black Label Trading Co’s Bishop’s Blend gives off some great musk, grape, and spice aromas while the foot of the cigar is much more modest giving off only a small amount of spice and natural tobacco aromas. The cap cut clean and easily using my Xikar XO double bladed cutter. 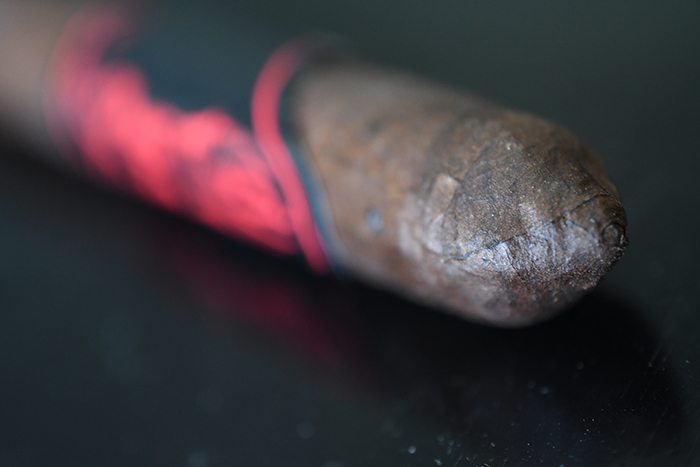 The cold draw produces some great musk, leather, dirty earthiness, spice, and natural flavors. 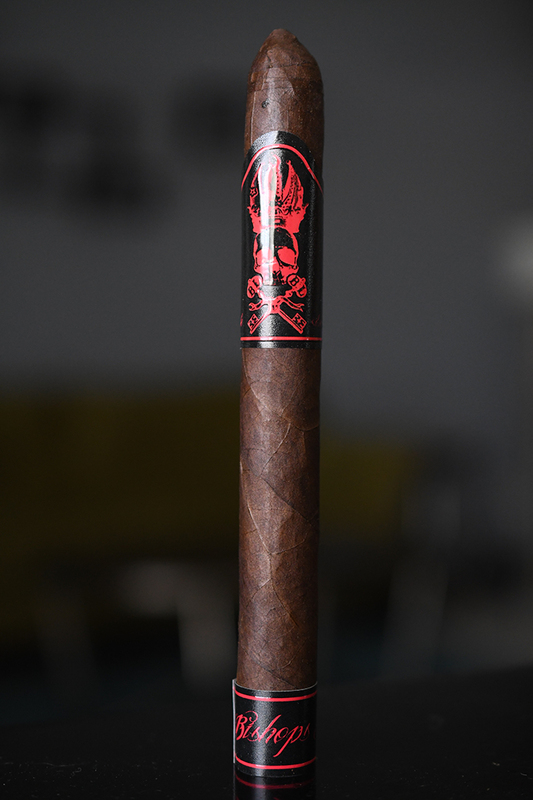 Black Label Trading Co’s Bishop’s Blend starts out with a nice, expected cayenne pepper blast which lights up my mouth through the first few puffs. After a while the pepper fades and I am left with a whole mess of raisin, musk, brown sugar sweetness, spice, dark chocolate, coriander, oak, and natural tobacco flavors. This is a hell of a way to start off a cigar. 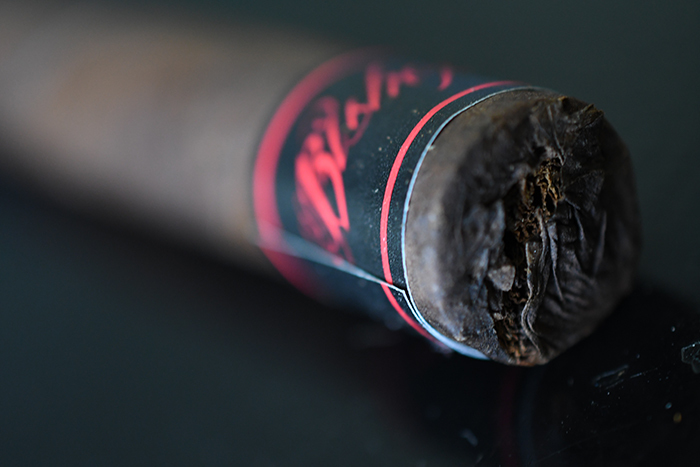 Although the cigar is wrapped rocks hard tight, the draw is flawless as each puff kicks out a great amount of thick, white smoke which hangs around only second before dissipating while the cigar itself releases only trace amounts of stationary smoke as it rests in my ashtray. The burn line has some soft waves to it, but nothing too concerning as it leaves behind a trail of slightly compacted medium to light gray ash which held on for about an inch before falling into my ashtray. Into the second third of Black Label Trading Co’s Bishop’s Blend and there brown sugar sweetness I picked up earlier has now transitioned over to a full-force vanilla which is leading the charge along with the musk flavors backed by raisin, spice, dark chocolate and oak with a few reminding aftertastes of natural, earthy, tobacco. The retrohale really brings out the spice and oak. The burn line is still slightly wavy but with no real issues and I close out the second third with a soft little nicotine kick already. 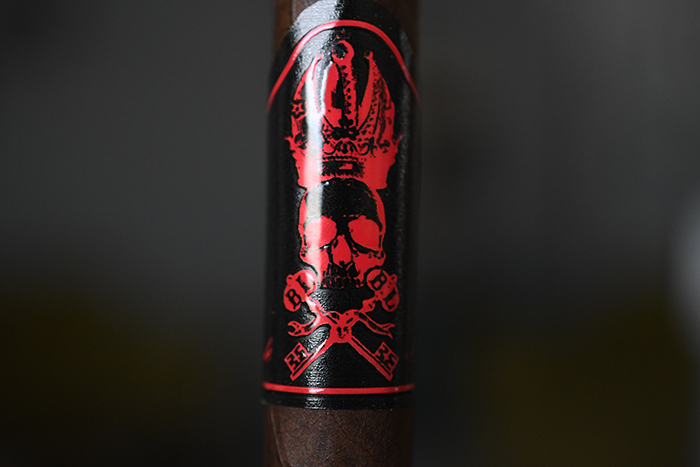 In the final third of Black Label Trading Co’s Bishop’s Blend the flavor profile took a turn into more of a toasty, dark chocolate lead profile backed by soft vanilla, spice, lots of oak and musk and just a dash of raisin and sweetness. It took me almost two full hours to take this cigar down to the nub and I experienced very little nicotine, no extended heat, nor did I ever had to touch up or relight the cigar. 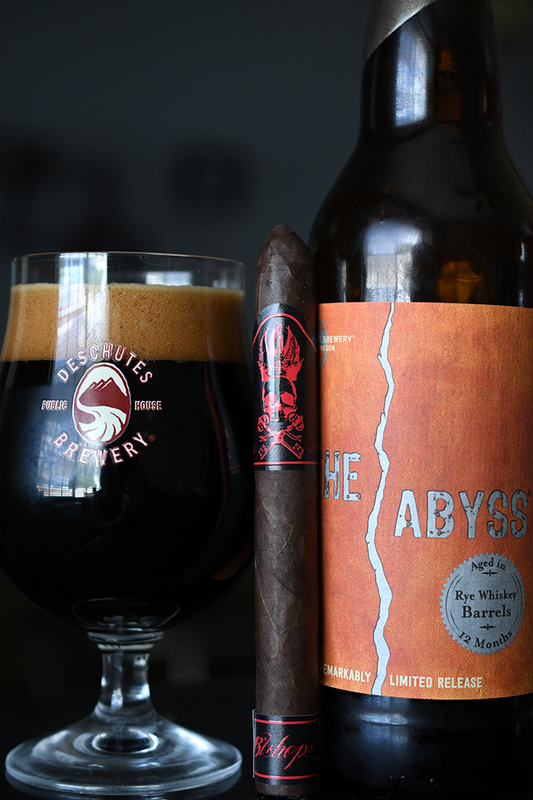 Brewed by Deschutes brewing in Bend, Oregon the Abyss variants have repeatedly found their way into my reviews throughout the year. They are one of my favorite beers the company makes and consistently pair well with bolder cigars. The beer is an imperial stout brewed with Molasses, licorice, vanilla beans and cherry bark. This particular variant is aged in Rye Whiskey barrels. The beer leads with massive amounts of sweetness, vanilla, oak, dark chocolate, and malt with a very heavy mouthfeel before finishing with even more sweetness and vanilla, musk, malt, dark chocolate, coffee, and just a dash of rye whiskey. This sticky mixture fo flavors is almost identical to the existing flavors present in Black Label Trading Co’s Bishop’s Blend and made for one of the best pairings I have had in such a long time. The most impressive part of the pairing is that both the cigar and beer could easily overpower just about any other selection, but in this case not only held their own but helped create a hell of an experience.